On Sunday, a gigantic solar flare erupted from out of the sun and began charging toward Earth at millions of miles an hour. This was a coronal mass ejection, which describes balls of gas consisting of charged particles and magnetic field that get spewed from the sun’s outer atmosphere. Such eruptions occur when magnetic energy in the sun piles up and then gets suddenly released in a twisting motion caused by convection in the sun’s outer zone. The material was moving at a faster velocity and with more radiation than anything heliophysicists had seen in the past seven years. But on a scale of 1 to 5, the storm only clocked in at a category 2. This NASA video shows the sun’s activity from Jan 19 to Jan. 23. For two days, it barreled toward Earth at speeds of 1,400 miles per second, and as forecasted, reached the Earth at about 9 a.m. ET on Tuesday morning. And what happened after that was… not much. Airlines rerouted their northern flights to more southerly latitudes to avoid any communication outage or radiation hazards. Some satellite operators have reported noise on the systems, caused by the proton emissions. Northern lights in northern Canada and Alaska are expected to intensify. But no major damage was reported. 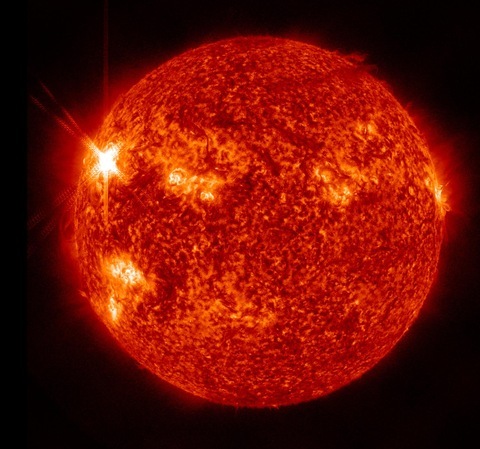 The chief concern when powerful solar eruptions go earthbound, is that the energetic protons will disturb the Earth’s magnetic field, jolting and disrupting satellites and power grids. The upper atmosphere of the earth, the ionosphere, becomes turbulent, like an ocean in a storm. And our Global Positioning System, which lives within satellites above the ionosphere, has to punch through that electrical storm to send its signals to earth. “It shortens the lifetime of solar cells on satellites, and it can damage electronics,” Hesse said. High radiation levels can also be potentially harmful to astronauts in space. An extreme solar storm struck in October 2003, and lasted almost two weeks. Ground-induced currents caused damage in electrical power grids. GPS systems failed. The effects of this week’s events, by contrast, will likely be more cumulative than immediate, Hesse said. The solar panels on satellites, for example, suffer from repeated radiation exposure, which can compromise the lifetime of the equipment.